NORD DRIVESYSTEMS presents the newly developed NORDAC LINK series field distribution systems. These new AC vector drives and motor starters are in the final phase of field tests. Serial production will commence early in 2017. Coded plug-in connectors for power, communications, sensors, and actuators enable fast, safe installation and commissioning. LEDs that indicate switching states, operation modes, and signal states allow operators to diagnose errors directly on site. Maintenance and control switches on the device facilitate plant servicing and system set-up. Designed for flexible configuration, NORDAC LINK drives are especially suitable for conveying applications, but can also be used with other machines and systems. Integrated functionality ranges from rotary encoder support and brake management to PI control and sequence control through an integrated PLC. The drives feature a high overload capacity. 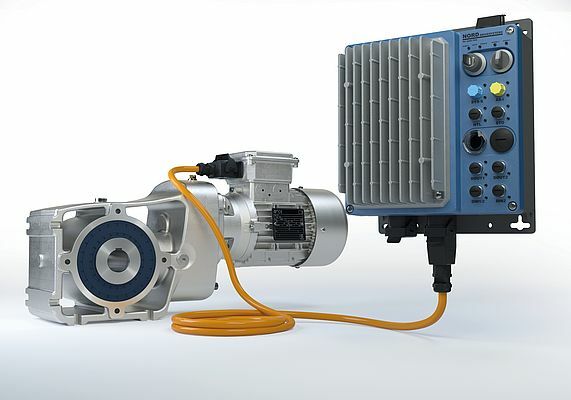 They enable very precise control of either asynchronous or synchronous motors and reliably deliver full torque even at zero speed. Moreover, the drives provide extensive monitoring functions to protect the mains, the motor, and the driven machine. Power supply can be daisy-chained from one drive to the next. This greatly reduces the cabling effort and costs, particularly in complex applications with hundreds of drive axes.